Merci à Blacque Jacque Shellacque pour cette bière! it's been a rough past month and a half, dealing with severe depression, alcoholism and working more than full time - hell, I was working on a byelection campaign, a really successful one for Western Canada, we only lost by 390 votes! Now it's time to get back to my true love, la bière! Tonight's review is of St Ambroise Double IPA by McAuslan Brewing out of Montreal. I love the St Ambroise brand, it's authentic, it's one of the first popular brands of microbrewed beer to ever hit Canada and stay a micro, even with Moosehead owning them for a few years until Brasseurs RJ bought up the remaining portfolio this past spring. McAuslan's St Ambroise line of beer is special and unique, but you just can't find it in Manitoba, so I have friends in Saskatchewan and out east who pick some up for me whenever possible, tonight.. it's their DIPA! Appearance:The DIPA pours a hazy orange, decent amount of carbonation, somewhat clear but yet hazy. Nice lacing of off-white head. Aroma: A nice sweet yet bitterly hoppy aroma. Some sweet tropical notes like pineapple, pine, alfalfa, orange peel and a zest of lemon, incredibly well balanced. Taste: The very sweet yet better in-yo-face flavour transfers over from the aroma, it's incredibly sweet for a DIPA, much like a New Zealand style IPA in ways, as well with a nice PNW bitterness to it as well. Lemon zest, pineapple, yum yum. Overall Thoughts: Very straight forward but a very solid DIPA, easy drinkability, quite a sweet DIPA compared to lots of the main DIPAs on the market today. Doesn't lack in the hops in any way either. Would love to see this in a mixer pack in Manitoba.. one day.. bah. Surprisingly 8% ABV! Our master brewer uses the word "intense" to describe St Ambroise Double India Pale Ale. 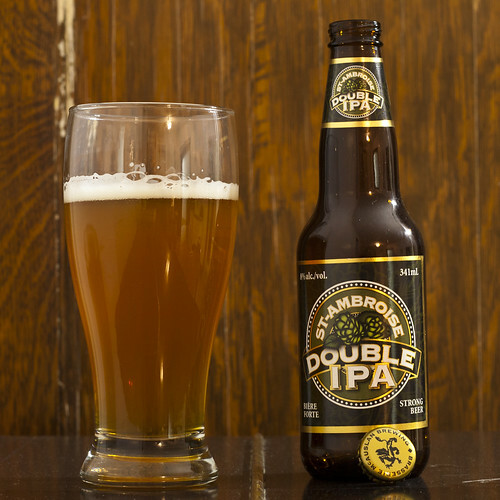 If you like hops and you like malt, you will love the citrus aromas and the full-bodied taste of this unfiltered St.Ambroise Double India Pale Ale. Ingredients: Water, pale malt, hops.